The Irish singer/songwriter reveals the cover & tracklist of his sophomore LP. Hozier joined the ranks of Ireland’s musical elite (U2, Van Morrison, The Cranberries and so many others) when “Take Me To Church” stormed the charts in 2014 and 2015. The 29-year-old backed it up with a mega-selling, critically-adored debut LP and then spent the next two and half years on the road. Instead of rushing back into the studio, the breakout star found a bungalow in the Irish countryside and spent the next year getting back into the groove of everyday life. With his batteries recharged, Hozier got to work on his sophomore LP. Wasteland, Baby! finally arrived at the beginning of March and promptly topped the Billboard 200. Not only has the album been a commercial success, but the songsmith has succeeded in creating a body of work that is wider in scope and richer in sound than his debut. The fact that it still explores many of the themes (albeit from different angles) and packs just as hefty an emotional punch is a testament to his formidable songwriting skill. 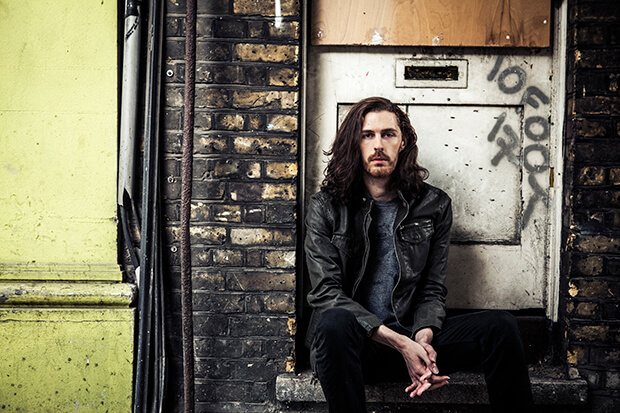 I recently spoke with Hozier about the many layers of Wasteland, Baby! and his upcoming show at Los Angeles’ Hollywood Forever Cemetery. Catch up with the Irish hitmaker in our Q&A below. When I interviewed you in 2016, you said needed to take some time off to decompress and recharge before thinking about another album. How long did it take for the creative juices to start flowing again? I probably got home in August, 2016. No, maybe late July. So, I moved back to Ireland and then moved into a new place in September and I probably started recording within a year. I do remember I enjoyed that summer, I remember swimming quite a bit and really enjoying that. I think, I took about six months to kinda decompress and then I wrote the record in about the next six to 12 month period. So it took me about 12 months to get back in the studio, I’d say. Was it easy to slide back into everyday life after being in the touring bubble for two or three years? Yeah, it was about two and a half years. I’d be lying if I said it was easy. It took me months to decompress. You’re kinda clawing at the walls for ages, you’re so restless. It took me a while to learn how to relax and how to chill out. Tour life is fantastic, it’s incredibly high-energy. You’re wired the whole time. You’re always busy, always talking to people, you’re always working. But it’s not real living. It took a while to get to a place where you get up in the morning, make yourself breakfast and go for walks, and just be a normal person. That took months. It took me a while. But I really, really enjoyed it. I was living alone in the countryside, in a bungalow. That was super good. Do you remember the first song you wrote for the new album? I remember writing a couple of tracks, I remember writing a few ideas. Or sitting down at the piano and hammering some stuff out. I have this bad habit of trying to write six, seven, eight songs at once, and so I’ll just keeping hiking back through loads of ideas. So, I remember sitting down and coming up with piano ideas and piano chords. “Movement” would have been a really early idea that took months to form into the song. And “Nina Cried Power” too, maybe I had some piano ideas for that. You mentioned “Nina Cried Power.” That was one of the first new songs we heard. Why did you decide to put out an EP before the album? I think I had been away, certainly given how quickly people release music now, for what people consider to be a long time. I just wanted to share with listeners and fans something I had been working on. And that song just seemed like a nice way to introduce what I was working on. It just seemed like the right move, it seemed like the time was right. There’s a cliché in the music industry about the sophomore slump, the idea that second albums can stumble under the weight of expectations. How did you avoid it? Of course, there’s a lot of pressure that you create for yourself. I just wanted to make sure I was making music that still came from the same place, or was still music that I wanted to hear. I think it became less of a pressure because I moved to the countryside and just wrote on my own. I was able to remove myself from the usual hustle. I wrote it in the same way I wrote “Take Me To Church.” Which was, “Look, here’s a song that I just want to write,” as opposed to writing something that I ever thought could potentially be a “pop hit.” So that made it easy. The difficult part was, because I had been on the road for so long, I had so many ideas to explore. The hard part was actually choosing what not to explore. What to explore, and what not to pursue. Picking the songs was the hardest part. I’m guessing you don’t have too many real-life experiences on the road. Where did these ideas some from? Yeah, I was reluctant to write too much stuff that was particular to “road-living.” There’s maybe one track or two tracks on the record that allude to that. I was reluctant to look into that too much. Also, touring becomes a bit of a groundhog day. I think you would bore people to tears if you wrote about that. Maybe the months I spent at home living a normal life enabled me to absorb things that weren’t just tour-living. Did you find yourself going back to some old themes? Some of the subject matter seems to flow from your debut. Yeah, definitely. Sometimes I do characterize a song as a “sibling” song to something else I’ve written before. It’s like a brother or a sister, or a cousin or a distant cousin, of something else. I think with regards to, let’s say, playing with certain language or playing with religious iconography and trying to turn it on its head, for the sake of maybe subverting stuff like that, there are parallels. In the interim years, between the first album and the next one, I just found that religious institutions that justify their actions based on the word God didn’t dissipate in power or dissipate in their effect on people. In a lot of ways, they fanned themselves closer to the seat of power in those interim years. It reveals their legacies and, I suppose, the awful results of these legacies reveal themselves all the more horribly in those years. And the extent of that legacy revealed itself quite a bit in those interim years. I still found it was wild and I found it interesting to play with that. Sonically, Wasteland, Baby! is richer and deeper. Did that have something to do with working with producers like Ariel Rechsthaid and Markus Dravs? It depends on the song, I think. I was definitely playing around with harmony a bit more, and the chord progressions, sometimes they’re just that little bit more colorful, or there’s a bit more to them, and I think it starts there. In certain cases, with Ariel Rechsthaid, he’s got such a command of interesting textures and sounds. And then with Markus Dravs, he’s great at pushing you towards doing more and more and more, trying this out, such as with a song like “Movement.” It definitely was nice having done the first record, you have a bit more confidence in exploring ideas and yeah, maybe the songs are a little bit more ambitious. Is it somehow freeing not to have a song as big as “Take Me To Church” hanging over the album? I don’t think about it all that much to be honest. You write the songs as you feel you need to write them and how they’re received or the attention that each one gets, if one gets more attention than the other, that’s something you have no control over. So, it’s something I try not to allow to affect me or to influence my thinking. It just is what it is. “Take Me To Church” being the hit that it became was just really unexpected to me. It was a bit of an outlier. It didn’t sound like a Top 10 hit when we finished it, I don’t think it sounds like a Top 10 hit now. Do you know what I’m saying? Yeah, it stuck out like a sore thumb. I think the breakout song from this album might be “Almost (Sweet Music).” Is that going to get a video? I think that there is talk of it being pushed as a single, so I think there’s probably a video on the way for that song. It’s a fun tune. It was a nice little lyrical exercise for writing that one as well. I’m pretty sure that’s the next single. While we’re on the topic of videos, I’m obsessed with the one for “Dinner and Diatribes.” It has a witchy element, which is interesting because I hear your music in every crystal store in LA. Are you aware of your popularity in the metaphysical community? [Laughs]. No, I didn’t know that. Happy days! That’s cool. I don’t know how to respond to that. That’s so cool. I definitely have an appreciation for mysticism, I have to say. Some of that just comes from old-school, Western Ireland-type mysticism. Happy days! You might see some of that contingent at Hollywood Forever Cemetery. Are you excited about that show? I am actually, yeah. I’m looking forward to that, I have to say. It’ll be lovely. It was one we were kinda looking at for a while, like, “That’ll be a cool place to do a show.” I can’t wait, and also, I just love being in LA and playing shows. Can’t wait. What prompted your Destiny’s Child cover? It seemed a bit left-field. It was a bit left-field, yeah. I think sometimes when you’re on the road, inevitably somebody asks you to throw a cover out. That was one that we had been jamming in rehearsals, when we were kind of taking a break. We just had fallen into singing a slow-jam version of that. And Alex, my bass player, just threw a bass line in. And so we kind of had the shape of something that was fun and kind of old-school, sort of southern soul and it just made sense. Destiny’s Child would get played quite a bit on the bus, we play a lot of R&B from the ’00s and ’90s. One last question. Did your mother draw the artwork for Wasteland, Baby!? Yeah, she painted the cover. She also painted the cover for the first album. I suppose that was the start of our working relationship. When I was releasing singles, printing off CDs, the first few things I ever released and recorded, I used to borrow her artwork and borrow pictures of her paintings. We did a few shoots to get some source material for Wasteland, Baby! and then she painted that image. I honestly thought it was a photo. It’s actually a painting of, well it’s a composite of, a few photographs. So we actually did an underwater shoot. We set up a room underwater and there are photographs of me underwater with flowers and books. Talent obviously runs in the family, it’s incredible. Well, it all worked out in the end. Nice to talk to you again! Thank you very much, it was good to chat again. Do you love Hozier’s new album? Let us know below, or by hitting us up on Facebook and Twitter!